Seabourn Quest has the pleasure of exploring some really unique places throughout the globe. In Northern Europe Seabourn Quest could take you to explore the fjords of Norway, the isles of the UK, the rugged landscape of Iceland and even the unfrequented ports of Greenland. Across the Atlantic, discover the many amazing shades of orange as you explore Canada and New England, take a buck-list worthy cruise through the Panama Canal or take the ultimate journey to South America including opportunities to experience Antarctica or the Amazon. View all Seabourn Quest cruises, view a selection of Seabourn cruise deals or view more options for Seabourn cruises. Some of life’s most cherished moments occur around the table, and every meal with Seabourn is another opportunity to celebrate. Seabourn’s award-winning cuisine starts with the finest quality ingredients, infused with authentic regional flavors, prepared á la minute by our skilled chefs and served with pride. Before Seabourn, open-seating dining on a cruise ship was unheard of. Come when you like, with whom you please, and be seated as you wish. The room is beautiful, the cuisine is exquisite, and the service is simultaneously flawless, friendly and fun. Inspired by the classic American chophouse, The Grill focuses on updated versions of iconic dishes. Guests setting foot inside the elegant dining room will be treated to table-side preparations of Caesar salad and ice cream sundaes as well as a range of other steakhouse favourites like Lobster Thermidor and creamed spinach, presented a la carte. The timeless menu will draw on the freshest products from artisan purveyors. A cocktail program and wine list of domestic and old world labels complement the menu. The Colonnade is a more casual alternative with indoor/outdoor seating, sumptuous buffets and daily specials for breakfast and lunch. The Colonnade serves regionally-themed, bistro-style dinners with table service nightly aboard Seabourn Odyssey, Seabourn Sojourn and Seabourn Quest. Aboard Seabourn Odyssey, Seabourn Sojourn and Seabourn Quest, the Patio offers casual poolside dining featuring grilled specialties, salads and sides for lunch and dinner, and freshly baked pizzas throughout the afternoon. Lunches and dinners are offered at the Sky Grill, serving grilled specialties and simple sides. Helping you create the perfect day is something we take to heart at Seabourn. It’s why our lounges and decks are open and inviting, the ambiance relaxed and the variety of activities offered plentiful. You’ll find plenty of ways to create the perfect day, over and over again, and all the time to enjoy it. After all, this is your journey, and you can make it anything you want it to be. The art of conversation has always been central to the Seabourn experience. Our voyages attract interesting, interested people -people who enjoy talking together, sharing their interests, their adventures and discoveries, and their life stories with longtime and newfound friends. Their enthusiasms and curiosity are far-ranging, and these are what spark their desire to travel the world. Shop a bustling Sicilian market, gather spices in Istanbul or explore the local wines of Tuscany and Provence. Wherever you are in the world, you’ll enjoy an insider’s look at unique regional markets with an expert Seabourn chef as your guide. The award-winning Spa at SeabournSM center anywhere in the world we sail. Enjoy a thermal wrap surrounded by Antarctic icebergs, or exercise on a Kinesis Wall with views of Santorini’s cliffs. Many veteran cruisers specifically choose cruises that provide at least a few days at sea. 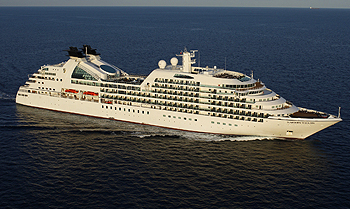 Seabourn Quest will be a great choice for the sea-loving cruiser who craves that languorous feeling of lazy leisure. There will be loads of on board activities during those days, including a great game of bridge. Quest has a beautifully designed card room on Deck 7, forward of Seabourn Square. Our Fitness Centre features high performance Technogym equipment for cardio and strength training. We also offer a series of complimentary classes including yoga, Pilates and Tai Chi. Or, if personal attention is preferred, our personal trainers will design a nutrition and exercise plan that will help you achieve results. Based on your body’s particular needs, this personalised session will expose you to the wellness program that works best with your body. The Retreat – 9-hole contoured golf putting green found on Deck 11. The Seabourn Shop features shield-emblazoned logo wear. The Boutique offers fashions, cosmetics, scents and designers’ luxury goods. The Collection is a curated selection of fine watches and jewelry including a private showroom for diamonds and other gemstones. Enjoy an exclusive Seabourn Marina Day with complimentary kayaking, pedal boats and board sailing from a marina at the ship’s stern or from a beach. Watch the stars, both on the big screen and twinkling overhead, as you snuggle up for a Hollywood classic or a big hit on the pool deck. If dining outdoors is a favourite of yours, visit the Sky Grill. There, Seabourn chefs serve up casual, al fresco fare. The Sky Grill is the perfect place for a delightful lunch as you watch the world pass by from the top level of the ship. The grill is also open for occasional dinners featuring grilled specialties such as steak and lobster. A favourite place for an early dinner is the Patio Grill. Open even if it is a bit chilly outside, crew members carefully wrap passengers in blankets, if needed. In The Club, bring your dancing shoes and show off your moves or watch others trip the light fantastic to the live band.